WILLEMSTAD - According to the Curaçao Ports Authority (CPA), if everything goes according to schedule, the cruise ship Britannia, with a passenger capacity of 4,324 people, will arrive on the November 13 at the Tulapier. This will be the first ship to dock at the brand new mega pier. The construction of the second mega pier has had a number of setbacks. Some of the issues were the coral damage during the construction and the rough sea. 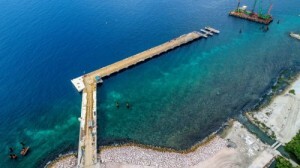 But the CPA indicates that they are working hard to satisfy their customers and they will ensure that the pier is ready to receive the planned ships. Other ships that will dock at the second mega pier during the coming period include Aidadiva on November 14 with a capacity of 2,500 tourists, Carnival Conquest on November 15 with a capacity of 3,783 passengers, Celebrity Eclipse on November 21 with a capacity of 3,013 tourists and Carnival Vista on November 22 with a passenger capacity of 4,683.